Peru is the third largest country in South America with a land area five times that of the UK. Peru has a long Pacific Ocean coastline buttressed by the high and rugged mountain ranges of the Andes which are flanked to the east by the heavily forested slope leading down to the Amazonian plains. The tropical latitude and varied topography give Peru a large diversity of terrain and climates including beaches, plains, deserts, mountains and rainforest. 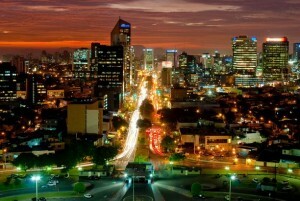 Peru is one of the region’s fastest growing economies. It is rich in mineral resources including silver, zinc, copper, molybdenum, lead and gold. Ores and minerals make up over half the country’s exports with China a key trading partner. Demand pull from Chinese manufacturers for raw materials is so significant that the strength of Peru’s economy shadows the health of the Chinese manufacturing sector. Peru has a vibrant economy but a small energy sector. Energy prices have been kept low by successive governments and both installed capacity and energy consumption are currently at modest levels. Increase in demand for energy is highly dependent on new mining investments. Current growth levels of around eight per cent mean that the installed capacity will need to double within ten years from its current level of less than 8GW. Peru is blessed with rich energy resources. It has substantial reserves of proved onshore oil reserves in the Amazon region and third largest natural gas reserves in Central and South America, following Venezuela and Mexico. While difficult geography and a lack of investment means that much of the established reserves remain in the ground, the oil industry believes there is considerable unexplored potential for new discoveries. Historically Peru relied on hydropower until natural gas from its huge Camisea field in the Amazonian rainforest came on-stream in 2004 and now electricity generation capacity is split equally between thermal and hydropower. Peru’s National Energy Plan for the decade to 2025 aims for sixty per cent of generation to come from renewable sources, including traditional hydro. Renewable energy resources are excellent notably because Peru’s climate and terrain is so suitable for hydropower. The potential for wind and solar power is good, but a lack of infrastructure, regulatory framework and investment means that these new industries are in their infancy. In 1972 Peru’s biggest electricity distribution network owner Electrolima was nationalised and a state-owned company Electroperu created with exclusive rights on national generation expansion. Peru’s public service system was organised into vertically integrated power utilities with Electroperú and Electrolima providing about two-thirds of the country’s electricity services through the national interconnected system Sistema Eléctrico Interconectado Nacional (SEIN) and nine regional companies providing the rest to isolated power systems. The last two decades of the twentieth century saw a worldwide trend for restructuring and liberalisation of state-owned electricity monopolies. The rationale was to unbundle vertically integrated power generation and distribution systems in order to attract private investment and increase efficiency. Globally, the standard reform model has arguably been most influential and far-reaching in Latin American countries. Peru’s neighbour Chile pioneered privatisation of power generation and distribution systems and liberalisation of the electricity market with its 1982 Electricity Reform Act. In Peru the poor performance of companies, cross subsidy policies, political intervention in price regulation and adverse macroeconomic conditions were identified as the main drivers for change. Peru applied a standard reform model including the creation of independent regulator, unbundling, privatisation and wholesale competition in its electricity market reform which began in 1992. The Peruvian power sector saw the generation, transmission and distribution activities of Electroperu and Electrolima unbundled as private companies emerged as a result of the reforms. Currently six private companies own nearly all the high voltage transmission system, with the public sector owning some lines to supply remote areas. The last two decades have seen expansion of electricity coverage, reduction of distribution losses and improvements in quality (duration and number of interruptions). In 1990 only 45 percent of the population had access to electricity but this figure has doubled in the last thirty-five years. Between 2006 and 2013 Peru increased access to electrical power to more than one hundred thousand low income rural households in a project to extend the electrical grid and install solar power systems. The project required investment of 145 million US dollars, with a World Bank loan accounting for around a third of the total. Schools, health clinics and community centres benefitted as well as householders and small businesses. The project was instrumental in the establishment of a national tariff for regulated service with household off-grid photovoltaic systems and led electricity distribution companies to devise and operate rural electrification subprojects as part of their regular commercial operations. Peru’s energy sector is proving an attractive market for foreign investors and big consulting and construction firms including Siemens, Alstom, Vestas and Voith are finding Peru a key emerging market to offset the decline of projects in Europe. Development of an integrated electricity market is a key plank of a liberalised energy policy. European countries transmission systems are linked with interconnectors bringing islands (including the UK) into the market. Integrating South America’s energy markets could be advantageous, but political will as well as infrastructure is lacking. Peru’s previous government’s ambitions to turn the country into a regional energy hub, generating electricity from the Amazonian rivers and its abundant supplies of natural gas for export to Brazil and Chile foundered on social and environmental objections. An existing transmission line connecting Peru with Ecuador is under-utilised because the two countries cannot agree a price for electricity.